To achieve smooth, positive control of the helicopter during instrument flight, three fundamental skills must be developed. They are instrument cross-check, instrument interpretation, and aircraft control. At first, there may be a tendency to cross-check rapidly, looking directly at the instruments without knowing exactly what information is needed. However, with familiarity and practice, the instrument cross-check reveals definite trends during specific flight conditions. These trends help a pilot control the helicopter as it makes a transition from one flight condition to another. When full concentration is applied to a single instrument, a problem called fixation is encountered. This results from a natural human inclination to observe a specific instrument carefully and accurately, often to the exclusion of other instruments. Fixation on a single instrument usually results in poor control. For example, while performing a turn, there is a tendency to watch only the turn-and-slip indicator instead of including other instruments in the cross-check. This fixation on the turn-and-slip indicator often leads to a loss of altitude through poor pitch-and-bank control. Look at each instrument only long enough to understand the information it presents, and then proceed to the next one. Similarly, too much emphasis can be placed on a single instrument, instead of relying on a combination of instruments necessary for helicopter performance information. This differs from fixation in that other instruments are included in a cross-check, but too much attention is placed on one particular instrument. During performance of a maneuver, there is sometimes a failure to anticipate significant instrument indications following attitude changes. For example, during level off from a climb or descent, a pilot may concentrate on pitch control, while forgetting about heading or roll information. This error, called omission, results in erratic control of heading and bank. 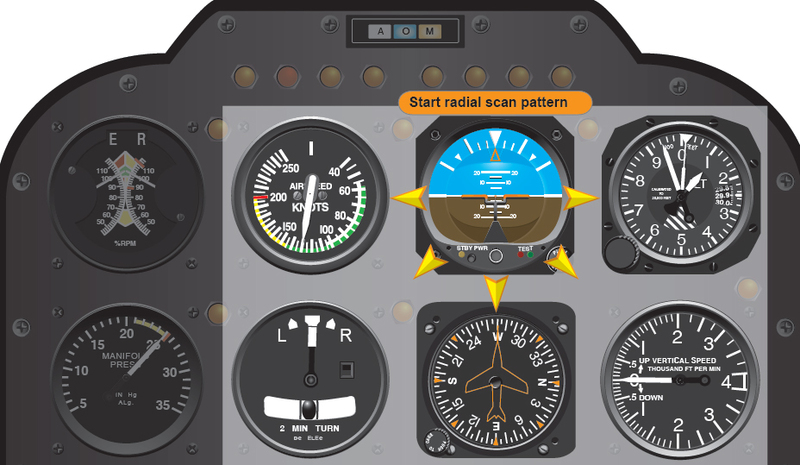 In spite of these common errors, most pilots can adapt well to flight by instrument reference after instruction and practice. Many find that they can control the helicopter more easily and precisely by instruments. The flight instruments together give a picture of what is happening. No one instrument is more important than the next; however, during certain maneuvers or conditions, those instruments that provide the most pertinent and useful information are termed primary instruments. Those which back up and supplement the primary instruments are termed supporting instruments. For example, since the attitude indicator is the only instrument that provides instant and direct aircraft attitude information, it should be considered primary during any change in pitch or bank attitude. After the new attitude is established, other instruments become primary, and the attitude indicator usually becomes the supporting instrument. Controlling a helicopter is the result of accurately interpreting the flight instruments and translating these readings into correct control responses. Aircraft control involves adjustment to pitch, bank, power, and trim in order to achieve a desired flight path. Pitch attitude control is controlling the movement of the helicopter about its lateral axis. After interpreting the helicopter’s pitch attitude by reference to the pitch instruments (attitude indicator, altimeter, airspeed indicator, and vertical speed indicator (VSI)), cyclic control adjustments are made to affect the desired pitch attitude. In this chapter, the pitch attitudes depicted are approximate and vary with different helicopters. Bank attitude control is controlling the angle made by the lateral tilt of the rotor and the natural horizon or the movement of the helicopter about its longitudinal axis. After interpreting the helicopter’s bank instruments (attitude indicator, heading indicator, and turn indicator), cyclic control adjustments are made to attain the desired bank attitude. Power control is the application of collective pitch with corresponding throttle control, where applicable. In straightand- level flight, changes of collective pitch are made to correct for altitude deviation if the error is more than 100 feet or the airspeed is off by more than 10 knots. If the error is less than that amount, a pilot should use a slight cyclic climb or descent. In order to fly a helicopter by reference to the instruments, it is important to know the approximate power settings required for a particular helicopter in various load configurations and flight conditions. Trim, in helicopters, refers to the use of the cyclic centering button, if the helicopter is so equipped, to relieve all possible cyclic pressures. Trim also refers to the use of pedal adjustment to center the ball of the turn indicator. Pedal trim is required during all power changes. The proper adjustment of collective pitch and cyclic friction helps a pilot relax during instrument flight. Friction should be adjusted to minimize overcontrolling and to prevent creeping, but not applied to such a degree that control movement is limited. In addition, many helicopters equipped for instrument flight contain stability augmentation systems or an autopilot to help relieve pilot workload.